You would never do this to yourself consciously. You, like everyone else, do not like to suffer. And yet, you, like everybody else, are sometimes subjected to the hidden force of self-sabotage. Committing yourself to a practice to awaken to your higher potential and to end the pain in your life is a sure way to activate this unconscious process. If you don’t want to fall prey to it, it is necessary to take a close look at the forces that will fight to maintain the status quo, that want to make sure your old level of pain is maintained. These are two-fold, the fear of change and the pain body. The unknown scares us, even when what is unknown is happiness or peace. Imagine living permanently in true freedom and joy. It would be like living in a different world, wouldn’t it? And stepping out of the zone of our habitual way of life can be very scary. When that fear arises we are likely to do something to prevent us from changing. The pain body is our unconscious tendency to cling to that part of our identity that is used to pain. “Who would I be without my pain?” is a difficult question for many to answer. We’re just so used to our difficulties. We create our own reality through our thinking and our emotional patterns. Unless we change them, the same problems are likely to happen again and again, including our tendency to self-sabotage. This is how we can stay stuck for a long time. 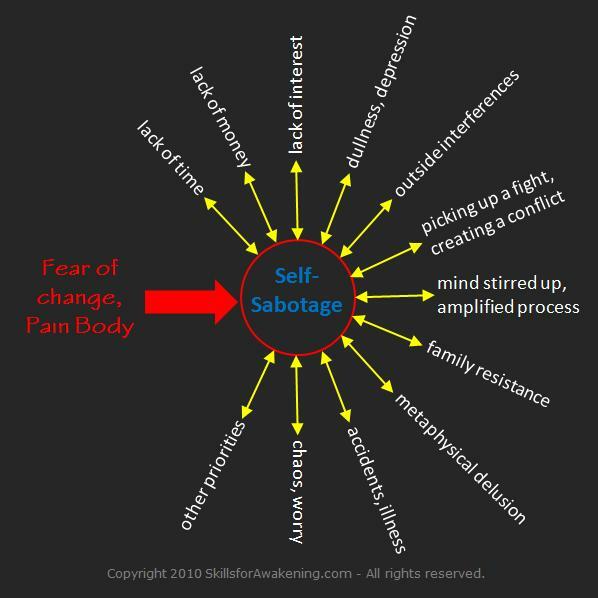 When you make the decision to take your life onto a higher level of functioning, the unconscious force of self-sabotage rears its head. It can come in many forms, all of them appearing completely convincing: You have no money, no time for it, the effort is too much trouble, or you get yourself distracted. Although these may be untrue pain body manifestations, they appear completely compelling to you. Even more difficult to see are self-sabotage events that appear to come from outside: external interferences, family objections, accidents, illness, a sudden increase in problems or outright chaos and more can all be the outcome of your unconscious desire to reject your impulse to improve your life. Some interesting self-sabotage events are completely unforeseeable events that interfere with your life. Most people would not ever suspect that such events can be brought on by their own subconscious – until such events repeat themselves at similar junctions in life. There are also what I call ‘metaphysical delusions,’ the conviction that grace will take care of you, that all is really fine, or that no action on your part is necessary. The truth of course is that grace comes to us in exact proportion to self-effort. The resolution to this challenge comes when our fear of change and self-delusion gives way to the will and courage to change. This happens when our yearning to experience the true freedom of liberation from suffering has become stronger than the old habits of interference. How does that happen? This inner maturing can be accomplished by two forces: by suffering and by a decision to do what is necessary to reach this freedom, aided by a deep yearning or desire for it. Yes, we have a choice here: if we are able to make the decision to free ourselves proactively from the inner obstructions, we can avoid the necessity for suffering to give us this motivation. 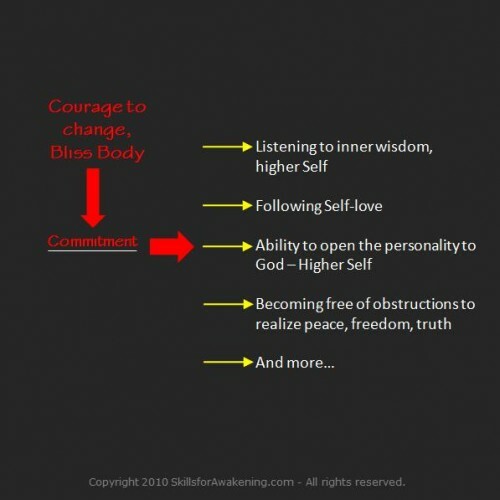 When we are thus no longer fully subjected to our pain body and the fear of change, we arrive at a true commitment to our freedom. This gives us the ability to listen to our internal wisdom and to follow the Heart, our inborn ability for self-love. It empties us of the small self, the contraction of the fear-based aspects of ego, and opens us to the astounding presence of the Higher Self. This alone is true freedom. Thank you for this reminder, Ram Giri. This is really where I’m at in this period of my life. Well, I’m in the process of getting clear about my inner sabotager and how it works. That part of me has been very strong and active since childhood onwards (I’m 38) – and now that I’m looking closely at it to integrate it/”make friends” with it, I experience that it’s increasing. A bit funny, but also expected. I use the Work sheets from Byron Katie, which helps me a lot, but it’s not enough to really get to it’s core. Well, thank you for this post. I find Open Attention invaluable in addition to The Work. It enables you to deeply get in touch with the arising of emotional patterns. Through gaining this body-based awareness one becomes aware of the process of self-sabotage and this awareness dissolves it. For more on Open Attention, please see my website. It’s most important to know that a complete dissolving of the tendency to self-sabotage is possible. With that we can commit to it and through effort and grace achieve it. The alternative to doing this work is continued suffering – so my choice is clear.